For various reasons OzTrans has left the Canset development team. That said, the 1.0 release in the North American graphics archive will have to suffice for awhile longer. I have told the other members of the team (wallyweb and ISA), and have also contacted Pikka about taking over the reins and getting this set back on track. That said, he's got a couple of projects that need finishing up, and I do as well. There's A LOT of work involved as the set will need to be recoded from scratch. Look for something to happen beginning in the new year. I'd like to thank OzTrans for getting this set to where it is now and for his hard work the last 7 years. I'm sorry people have to wait a bit longer for the next release, but trust me, the results will be worth it. Last edited by DanMacK on Thu Nov 10, 2011 5:05 am, edited 18 times in total. Are there any electric locos? I think there are a few industrial electrifications in Canada, but nothing mainline? Pretty much, there were a few smaller lines here and there =>the St. Clair and Detroit tunnels were electricifed at one time and CN had electrification around Montreal (Which now uses electric MU's), but until Tumbler Ridge in the 80's, there hasn't been any major electrification. I was thinking of possibly adding a CNR boxcab or Electric MU <=Both these pictures are of the Montreal operations. Numerous schemes have been proposed/mostly by CP in the Mountains, but nothing ever came of them. We had A LOT of interurban lines around Ontario and quebec however, so maybe an older style electric boxcab (Maybe a steeplecab) and a couple of old interurban coaches may be needed. Seems reasonable. So basically, no electrified freight service until very recently. Well, no long-distance electric freight, and the Tumbler Ridge branch was just for coal. For the record, the GF6C Electrics have been mothballed for years. The smaller lines around Southern Ontario had a few electric locos for freight, but mostly we used diesels. I'd like to see electric on the Windsor =>Quebec City corridor, but I don't see it happening =>too many grade crossings. You shouldn't forget the Northlander! The DMU's for the Northlander are the late RaM's that the Dutch and Swiss railways (NS and SBB) ordered for the TEE service between Amsterdam and Basel/Zurich. MB already made them for his alpine set, if you ask kindly you may use them perhaps. That'd be a definite to include! In Australia we have a famous image of Canada with a tourist train and viewing area built into and above some carraiges. Travelling through fir forests and snow everywhere. What you're talking about are the dome cars. The US has them too, in fact there will be one that appears in the US set behind the SP "Daylight" loco, as a "special" car that appears in long trains (like the red dining car in the DBXL set.) I would imagine that certainly a Canadian set would have these, as you say, it is one of the things Canadian railroads are famous for. Dome cars are a definite. They were actually invented by the Canadian Pacific Railway (or so the story goes) around the turn of the century. CNR didn't have many domes however =>It was the CPR and the 1955 Stainless Steel 'Canadian' passenger train that made domes a Canadian icon. Probably have a round-end "Park" seried observation car like this. I don't think that we need any Electric locomotives in the set. All of the locomotives that I've seen are diesel. If electrics are used at all they're probably used in a very limited fasion. Well, Montreal has a fairly extensive commuter suburban system, which uses EMUs now but used to use boxcabs. Also there's a freight ore system somewhere with very powerful locos, but that is relatively recent. Canada doesn't have monorails or maglevs either, so it would be nice to include electrified if we can. After I posted I did a little digging and found out that we do have some electric locos. I'll do a little more research and post a few suggestions later. Well, Canadian electrics can be summed into 4 categories. The Interurbans, the "Tunnel Electrics", Industrials, and the Tumbler Ridge project. We've never had any extensive electric freight/passenger systems, and only 2 that could be classified as "Mainline" Electric. Interurbans: Interurban lines were basically the predecessors to the urban commuter lines of today. They linked outlying towns with the larger cities, and in some cases, like the London & Port Stanley, were actually extensive freight haulers. Freight locomotives looked like Centrecabs like this one on the Cornwall Street Railway, or Boxcabs like this one on the London & Port Stanley Railway. Interurban passenger trains were mainly motor coaches like No. 10 on the L&PS and mail/baggage was carried in cars like No. 41 on the Niagara, St. Catherines & Toronto Railway. Unpowered and powered trailers aere also commonplace. "Tunnel Electrics": This is basically my term, and covers the electrics that were used in Ontario and Quebec for hauling steam (and diesel in some cases) trains through the Detroit River, St. Clair River in Ontario and the Mount Royal tunnels in Montreal, Quebec. The Ontario electrics were used for hauling trains out of the steep grades on the border tunnels underneath the St. Clair and Detroit rivers. These were retired in the 1940's/50's when diesels became commonplace. Montreal's network is a bit more extensive. In a previous message I showed links to both the Montreal Boxcabs and the older EMU's. There were also a few Steeplecabs built in the 1950's. Industrial: The International Nickel Co. (INCO) had a number of electrics, but these are mainly for hauling ore from the mines to the smelters, and not adequate for long-haul service. Most of these are similar to the Interurban Centrecabs. Tumbler Ridge: The BC Rail's Tumbler Ridge branch was the only heavy mainline freight electricifation in Canadian history. 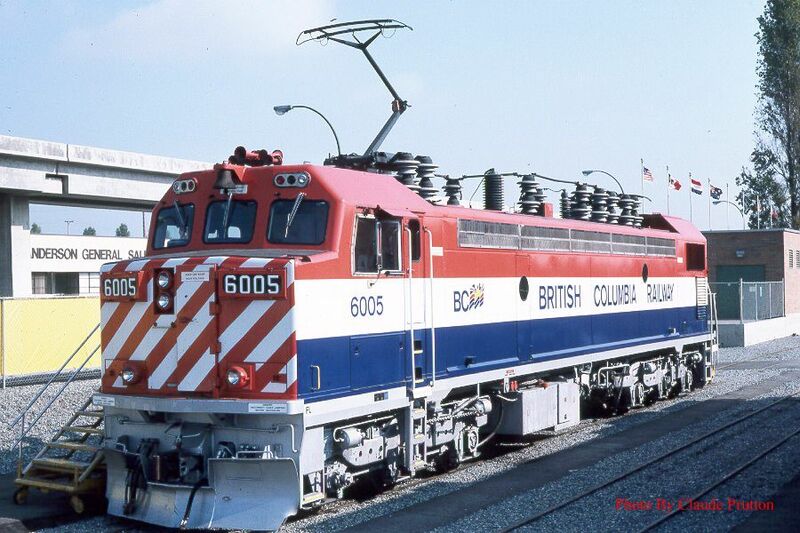 The GF6C locomotives were built by General Motors Diesel in London, Ontario. This loco appears in MB's Arctic set. As I said before, CP had thought several times about electrifying its route through the Rockies, but nothing came of it. In the late 90's, the GF6C's were retired, and with CNR taking over the line, it's doubtful they'll ever see active service again. Yes, I did some research and I found that there were only about 2 dozen electric lines in the country at most, with most of them in southern/ southwestern Ontario, and southern Quebec near the great lakes. This makes for slim pickings for electric locomotives, on the other hand, we definitely use diesel locomotives extensively so this gives us lots to chose from there. I would say you ought to include as many of the Canadian electrics as you can. It's OK if they would see limited freight usage, normally only a commuter passenger line has enough traffic density to justify electrification, unless you happen to require a very steep and heavy mountain climb for your freight, which in TTD is rare. Grade crossings are used on electrified railroads. AFAIK Sweden have lot's of them. What are the problem? The catenary are at least 4,5 meters about ground and the legal max for a lorry is 4 meters. I should have been a bit clearer. There are too many grade crossings for any form of high-speed rail, be it electrified or not. Basically, here we have idiots who drive AROUND the gates. I'm not sure how it is across the pond in Sweden, perhaps your drivers are more intelligent than some of ours. The situation is actually A LOT like TTD. Vehicles will get hit by trains, and with the number of crossings we have, that chance goes up. Couple that with the number of people who can't wait for a train and drive around grade crossings, plus the damage caused when a train hits a car doing 150+MPH, you can understand why a massive grade separation is needes for us to get high-speed rail. Well, if you make the front of the train pointy enough, it will knock the car out of the way and not hurt the train. That's the only real solution. Also you could make the crossing gates go all the way across the road so you can't drive around, the NEC fitted that sort of gate for exactly this reason. Sounds like a good opportunity for a Darwin Award. Not to mention a dew years ago, a driver hit the last car in a train.